Have you ever wondered if that collection of random supplements in your medicine cabinet are really doing you any good? Chances are if you aren't purchasing a product that's been third-party validated, you are wasting your money! In the US, the FDA does not regulate the ingredients used in dietary supplements. This means that bottle of Vitamin D on the shelf at the local store could actually really only contain rice bran and those fish oils could be tainted with heavy metals! For quality, third-party validated supplements, we have a few options that we recommend! Metagenics offers science-based, clinical grade supplements that have been created with the highest standards of research. From a simple multi-vitamin to probiotics to condition-specific formulas, Metagenics offers something for everybody! To get started, simply CLICK HERE to set up an account with Metagenics and receive 20% off your first order as well as 10% off and free shipping on all recurring orders! 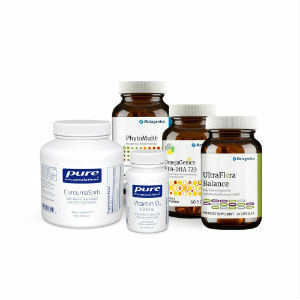 Our Pure Encapsulations store is designed with patients in mind, offering a convenient one stop shop of the highest quality dietary supplements, and athletic & rehabilitation products.